The far-western Himalayas have been virtually unexplored in part because they are absurdly remote and in part because — by Himalayan standards — the mountains are quite small. Few mountains in Western Nepal reach above 6,000 meters and only a handful reach 7,000 meters. Until very recently, when a team received a Piolet d’Or for climbing Gave Ding — a mountain 20 miles to the northwest of Bhandar Lek — the area had received little public attention from foreign climbers. Having lived in Nepal for four months researching environmental peacebuilding in the eastern corner of the country, I was eager to wander into the land of the West. After hours pouring over Google Earth I kept returning to the northern aspect of Bhandar Lek (a name for the mountain that only appears on Google Earth) and so hatched a plan to go explore the face. It should be noted that on most maps Bhandar Lek denotes an entire subrange of peaks of which Peak 6,024 meters is the highest. The mountain is cut on one side by Take Khola and on the other by Miniban Khola on the HMH NP109 Map. Some locals refer to the peak as Dhaule, after the name of the river that comes from the mountain, but most have no name for it. So it was that on December 7th I took a 12 hour local bus from Kathmandu with several of my neighbor’s chickens on my lap to Nepalgunj for the flight to Simikot with a 35kg pack. While my main mission was just to explore the area, I packed a full winter mountaineering kit and plenty of food “just in case I wanted to climb.” The trek from Simikot was long and brutally beautiful crossing several passes of 3,000 meters and Margor Lek Bhanjyang Pass (4037m) to get to Nepka. These villages are mostly unfrequented by foreigners — certainly not solo foreigners sweating under massive loads — and each town surrounded me with a curious greeting party and a tick tick ticking in disapproval of my light and shredded trail runners and the fact of my aloneness. My Nepali — fluent in Kathmandu — was strained trying to explain ice climbing to people with a far western accent but the kids and adults soon understood and would pretend to swing my ice tools into imaginary waterfalls. After seven days of body-wearing walking I reached Nepka, the last perennially settled village heading up valley toward Bhandar Lek and one of the most remote villages left in the Himalaya today. This same valley was accessed by a much larger team of six foreigners (Gorakh Himal Expedition 2015) heading to climb other 6,000 meter peaks in the area but they were turned around by heavy spring snow. In Nepka, locals tried hard to convince me that as a lone trekker I was sure to be eaten by any number of dangerous animals. Strangely though, the fact of my solo climbing didn't concern them. Further up valley, goat herders warned of an imminent chest deep snow. It was then that the true depth of my remoteness settled and the first feelings of fear sprung. A days walk up the turquoise river valley on a beautiful trail — the path to Tibet has become a popular way to get Chinese alcohol — took me past grazing mules and Yosemite’s Liberty Bell-like big walls. Diverting from the Great Himalaya Trail high route to Piplan, I took a small local footpath through the village of Mathillo Pali to meet the Loti Karnali River around 1800 meters. Whereas I had previously eaten every meal in people's homes, I now bought a small pot to cook in for the coming climb. From there, the path to basecamp at 3,500 meters brought me through a changing landscape of memory — one moment I was walking through Yosemite and Montana and the next I was in Alaska as the glacier-cut valley evolved. It was a bewildering moment seeing a mountain of Google Earth dream-drooling in real life as it emerged behind the ridge and into view. The mountain was larger and more intimidating in real life than when you can fly around it from a computer camera at 30,000 feet. My aloneness and the vastness of the mountains truly set in then and I decided immediately to turn around. But the following day saw a change of soul and I walked up the shadow-washed ice and cobblestone valley towards the mountain base to make a fire in the perpetual shade and sit for two days as my legs rested and my mind calmed. After nine days of walking and waiting I set off to climb the distinct ridge that splits the north face I had seen from Google Earth. The first day I climbed below the snow line up around 2,000 ft of bushy ridge to a camp on top of a large freestanding boulder as the first clouds in ten days rolled over the horizon. I woke the next day to more technical rock terrain, clear sky, and a 1,000 ft traverse on 65 degree snow with massive exposure to switch from one ridge to the next. While on either side of the ridge seracs were continually spitting ice, the ridge itself was quite safe from objective hazard. At the end of the snow traverse two rope-soloed pitches on the skinniest of ropes -- one slightly overhanging 5.7, the other sugar snow on steep, slabby rock -- shook my mental fortitude and made me wish for a thicker strand and a partner to belay. Day two ended at an awful camp with a barely body-width spot such that my tent overhung the ridge a foot on either side of where I slept. The third day brought me to the end of the technical ridge and around the last of several large gendarmes and around a difficult bergshrund to a camp 200 ft below the summit. The final day saw me over two more complicated bergshrunds (I had to climb in and out of the first on hard, blue, and overhanging ice) to the summit and down the other side of the mountain into an unknown valley. 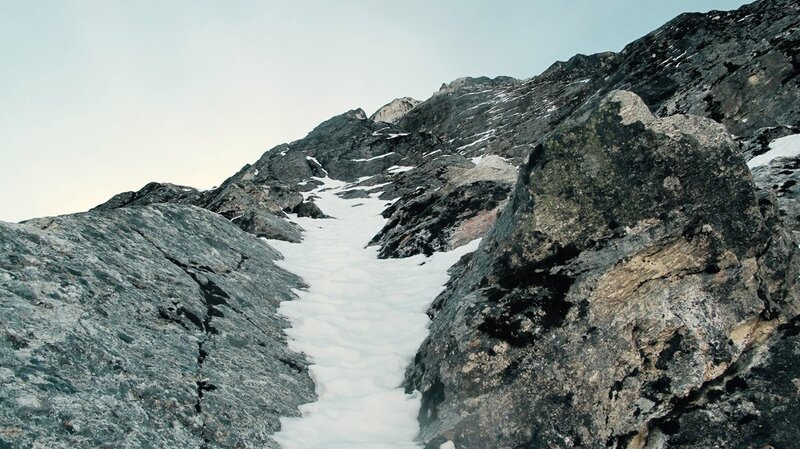 While the ascent involved relatively little objective hazard, the descent wove a route of down climbing and rock and ice (V-Thread) rappels through a minefield of steep loose blocks. After two days of descending and another awful camp I made it down the small glacier at the bottom of the mountain and out of danger. But the only truly close call came on the walk down valley, where at a narrow point in the valley a mini-fridge-sized boulder was kicked by a mountain goat from 600 ft and landed 20 ft from my head. As I topped the rise I had been walking towards I found the full herd of goats and I imagined that the boulder had been kicked down in defense. Walking down valley I picked up a local hunting trail which ended at the glacial river and a sick joke of a single three inch diameter flexy log spanning thirty feet across the ragewater. A six day walk out and a five day bus ride brought me safely back to Kathmandu. Far West Nepal is still full of opportunity for new climbing exploration of 5 and 6,000 meter peaks. Hopefully future parties will opt for light and self-sufficient adventures that support the local communities they visit on the way into the wild mountains of dream. Camp 1 Hanging Out on A Hanging Boulder. Camp 3. ca. 19,600 ft.
Route of Descent. Down climbing and rappelling with a 40 meter 6mm rope.